Some cats can adeptly leap through rings of fire and balance on hight wires. Cat trainer Doninique LeFort of Dominique's Circus Cats wows Key West visitors with sunset cat shows in Mallory Square. 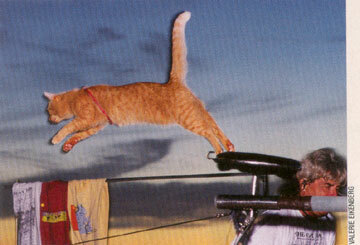 His felines faithfully follow every command, from gliding through hoops to jumping and staying on his shoulder. Dominique uses many types of techniques to command his cats, from facial expressions to verbal requests to gestures. In addition, he says he does not frequently use food as rewards since the cats are part of a show. "Start with what they like to de," he says. "One of my cats, Chopin, loves to follow me around, so we developed a trick where he walks between my legs three times. They love to play." Dominique says the key to training cats is developing a bond with them. He also explains that cats have an innate ability to focus on prey, and it's that same ability to focus that enables them to learn and perform tricks. For these extreme tricks, patience also is necessary: He says it can take up to three years to perfect one. So, to those who think cats can't learn tricks, Dominique shows the world they can. And as Bain notes with regard to cats, "It doesn't matter at what age you start." The proof is there: Even an old cat can learn a new trick. Take that, Fido!